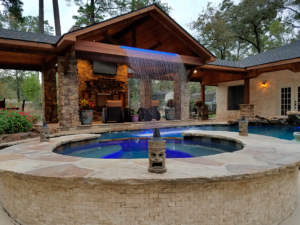 Warren’s designed and built this inviting pool oasis for a family in Kingwood, Texas. The pool and spa combination creates the ideal relaxing duo. 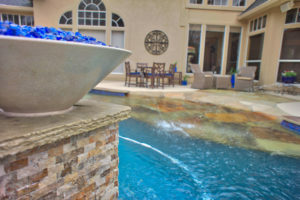 The pool and spa interior is constructed using an advanced PebbleTec surface finish and bordered with Peacock-Terra combination veneer waterline accent tiles to enhance its beauty. A flagstone beach entry allows easy access for swimming. Simple remote management pool controls automates tasks. 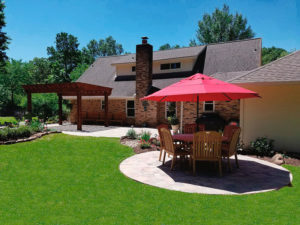 The architecture sits on solid hand-placed Oklahoma Wister flagstone patio & inlays. This elegant modern structure features travertine Stone columns, Cedar beams, and a tongue & groove ceiling. 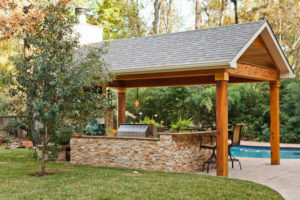 Bordering the pool and structure is a French country style landscape with Kichler LED landscape lighting. A Natural gas burning fireplace provides ample heat and dreamy lighting during the winter months. Fire bowls with glass accents add to the ambiance. Mounted on the columns are fire lanterns by Grand Effects which produce a fire like tornado in the lantern; they include remote control fire features to set the mood with a touch of a finger.